Comfortable apartment set in the heart of Rome, steps away from Piazza Navona, walking distance from The Pantheon, Campo de Fiori, near transports that will allow you to reach the other parts of the city, near shops and restaurants. Independent heating, TV cd & dvd player, washing machine, microwave, fans, dryer, computer, internet WiFi, balcony, no elevator. PLEASE NOTE : There is a fee for the use of gas and electricity of 5 euros / day to be paid at the check in. In the heart of the Historical Center few steps from Piazza Navona, overlooking Piazza Paquino and 100 meter from Campo dei Fiori (Trastevere is 5 minutes walk and the Roman Ghetto as well) a cozy apartment at the first floor of an ancient building XVI century (wood frescoed ceilings) composed by a living area one extra relaxing room, with two windows and a small balcony overlooking the Piazza, double sofa bed, one master bedroom, fully equipped kitchen, bathroom with shower. TV, wifi, DVD, autonomous heating, air conditioning. Lively area filled with restaurants, shops and small bookshops, 50 meter from the bus stop directly heading to Central Station in one direction and Sanct Peter in the other. Within 5 minutes walking: Campo dei Fiori, Piazza Navona, Trastevere, Piazza Argentina, Pantheon, Caffè della Pace. 10 minutes: Piazza Venezia, Via del Corso, San Pietro and the Vatican Museums, Piazza Cavour e Via Cola di Rienzo, Ghetto. 15/20 minutes Via del Corso, Pincio, Via Condotti Frattina, Piazza di Spagna and Spanish Steps. This was a fantastic apartment right in the heart of Rome. I loved it. It was spacious, full of roman character, close to transport, shops, cafes and all the major tourist spots. The owner Andrea was great, accomodating, helpful and contactable if anything was to go wrong. I didn't hear from cities reference once I paid the deposit for the apartment and also when I arrived in Rome (which I found very odd as I have been booking my apartments through cities reference for many years and have always been greeted by one of their representatives). Luckily I had been given Andreas number and he organised the key and the tour of the apartment. 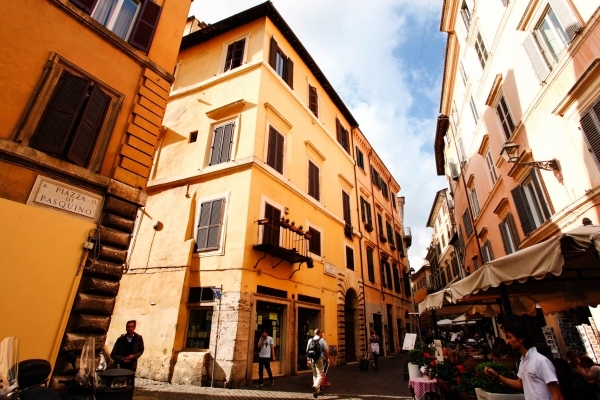 He also made some valuable recommendations of where to eat and what to do in Rome. Great apartment in great location in Rome! The apartment is in a great location in Rome - convenient walking distance to just about all the sights and areas of visitors' interest. It is, however, noisy at night. Everything was great except for a breakdown in communications: none of the FIVE contact numbers provided by the agency was the right one. Be sure you note down the owner's phone number from the profile page - he is more reliable than the agency!